How Intravitreal Injection can help? Intravitreal injections are commonly given to treat conditions where high concentrations of medicine are needed to reach the inner aspect of eye. The main aim of injections in most of these situations is to prevent further vision loss. 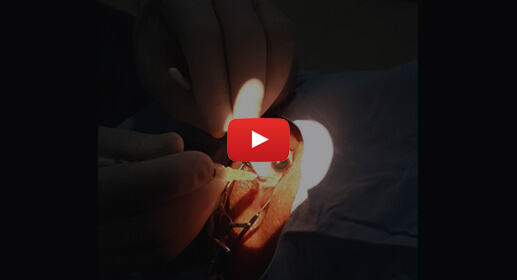 Some patients also experience a significant improvement in vision after the injections. it is a full length monoclonal antibody which has been developed for management of colorectal cancers. It is active against all isoforms of VEGF. Promising results have been noted when this drug has been used in the eye. It has a vitreous half life of 6.7 days with onset of action 3-4 days after injection. However, its use in the eye is currently off label. Razumab is a biosimilar of ranibizumab with good efficacy. It’s mechanism of action is similar to ranibizumab. It has been approved by Drug controller general of India (DCGI). It is yet to receive FDA approval. Trials to ascertain it’s efficacy as a stand-alone drugs are currently underway. VEGF Trap/EYELEA: This drug binds to the circulating and extravascular VEGF. It binds with VEGF isoform A and PIGF. It is supposed to have a higher affinity to VEGF ligands and is supposed to provide a better response amongst eyes which are not responding to either Bevacizumab or Ranibizumab. Its usage in eye is approved by FDA. Intravitreal triamcinolone injections are given in eyes with cystoid macular oedema, macular oedema secondary to diabetic retinopathy , vein occlusions and in eyes with non-infective uveitis. The drug acts for a period of 6 weeks and is associated with increased incidence of cataract progression and intraocular pressure (IOP) rise. The IOP needs to be monitored for upto 6 months after the injection. This is a longer acting injection with the period of action being about 3 months. The steroid in this injection is dexamethasone which is embedded in a non bio-degradable pellet. The injection is given using a 23-gauge needle and hence will need minimal local anaesthesia in order to reduce any discomfort. The drug carries a small risk of cataract progression and IOP rise. Preparation: Ideally patients are advised to come with an attendant. Drops are applied to dilate the pupil. The eye and its vicinity are examined to rule out any foci of infection. Presence of any active infection is a contraindication for this procedure. Procedure: The procedure is performed in the operation theatre. Before the medication is injected, the eye is numbed with anesthetic eye drops to help minimize discomfort. The eye is then cleaned with an antiseptic solution. A speculum is placed to separate the eye lids. The medication is injected directly into the eye. Patients might experience mild discomfort during the injection. 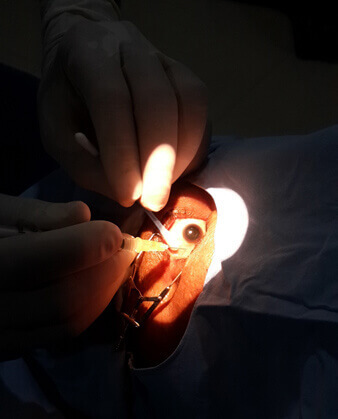 The eye is then patched for an hour after the injection after which the patch can be removed and post injection antibiotic drops are administered for a period of 1 week. The frequency and need for repeat injection would be dependent on the pathology being treated. Patients may experience some pain or discomfort after the injection. Sometimes, patients can develop subconjunctival hemorrhage (bleeding on the surface of the white of the eye), floaters, increased eye pressure and inflammation of the eye. These side effects typically resolve spontaneously or can be treated with eye drops. Other less common risks include infection (0.02-0.03% risk), bleeding in the eye, retinal tears or detachment and cataract formation. Patients who develop infection after injection notice decreased vision, swelling of eye lids, pain or severe redness of eyes. Patients who suspect any of these signs or symptoms must immediately report to their doctor.